Remember the Cinnamon Toast Crunchsicles? How the ice cream base was infused with the cereal? I thought it would be fun to experiment with pretzels. Then, just for “fun”, I added more pretzels and made some quick Nutella freezer fudge to go with. What’s freezer fudge you ask? I didn’t know either – until I made THIS freezer fudge and my world exploded. Freezer fudge is SO easy and so delicious, you won’t know how you’ve lived this long without it. 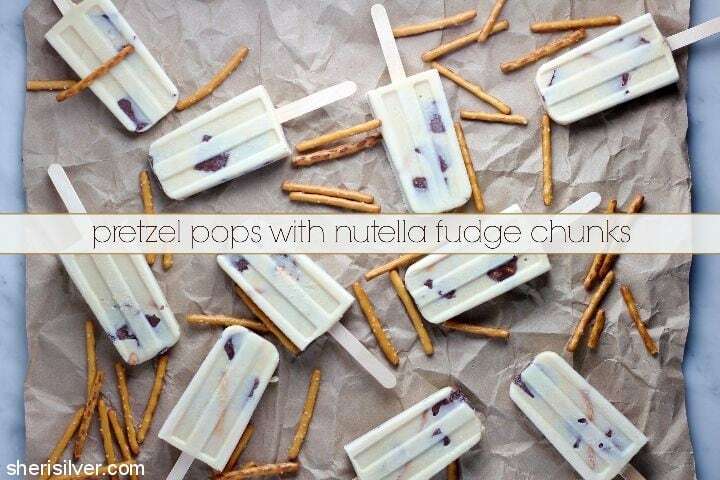 And because you keep it in the freezer it’s the perfect mix-in for popsicles! 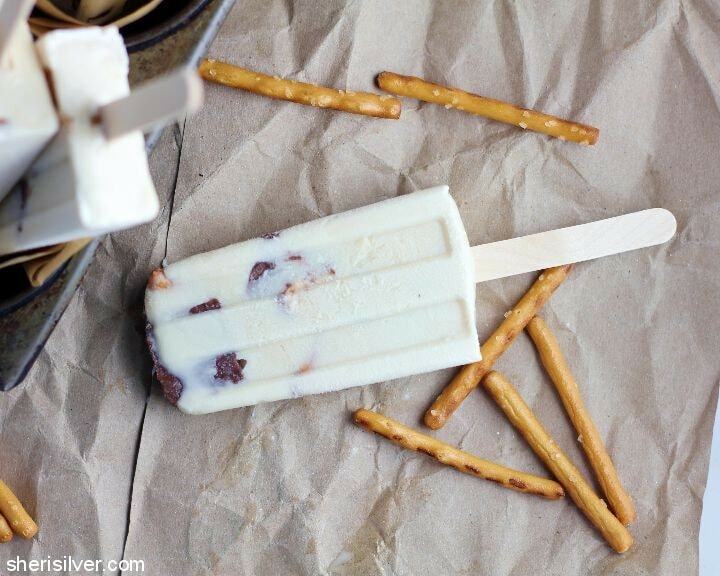 These pops were quite delicious – creamy, salty, crunchy, fudgy. Basically everything you could want in a pop. Or any other snack for that matter. One note: I used gluten-free pretzels for Noah – but GF pretzels are one of those foods that I think is BETTER than traditional. Crispier and crunchier, IMO, and held up nicely in the popsicles too. 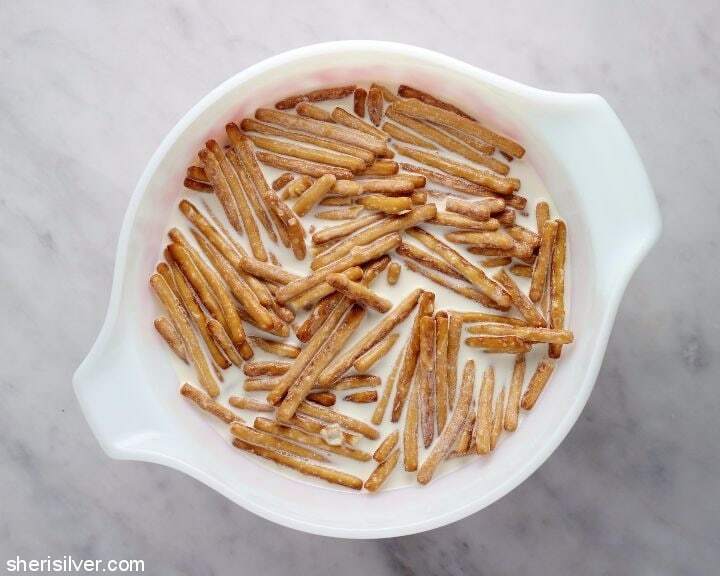 Combine the pretzels, milk and cream in a large bowl – stir well to combine and let sit for 20 minutes. 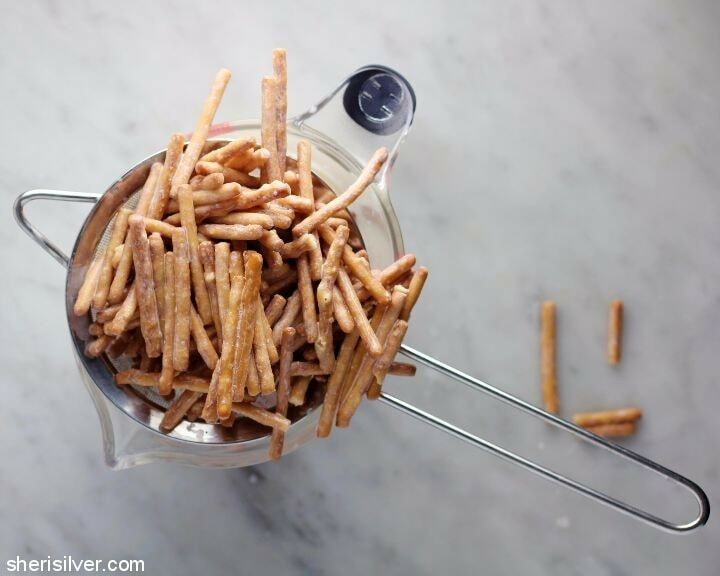 Strain the mixture into a large measuring cup and discard the pretzels. Add the sweetened condensed milk, brown sugar and salt. Heat in the microwave for 1 minute, stir well to combine and refrigerate for at least an hour (or up to one week). Make the Nutella fudge: Line an 8 x 8 pan with a parchment paper “sling”. Melt the Nutella and coconut oil over low heat till just incorporated. Slowly mix in the maple syrup; transfer to your baking pan and pop in the freezer till solid. 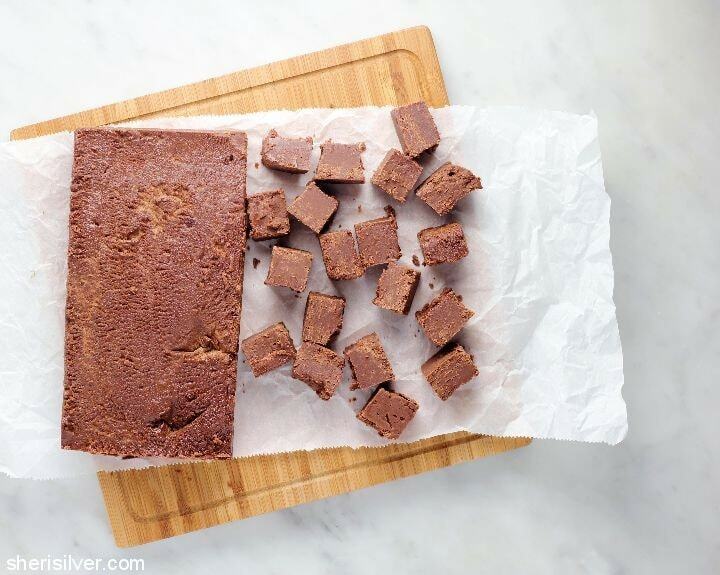 Remove from pan and cut into small chunks (you won’t use all the fudge for the popsicles – LUCKY YOU!). 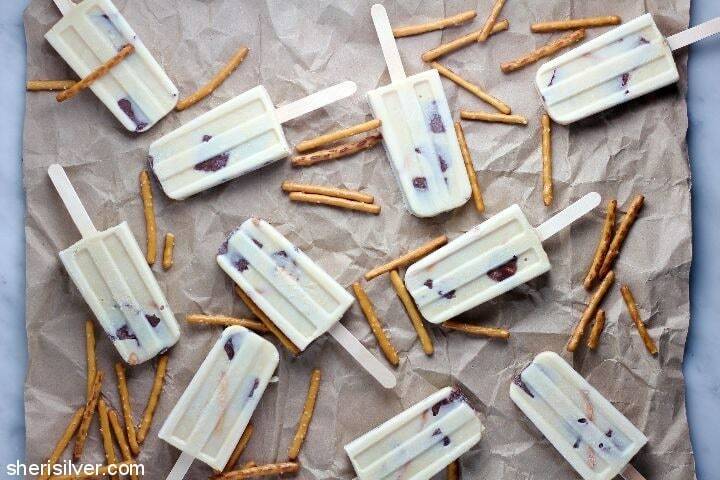 Alternate fudge chunks and pretzel sticks in each of your popsicle molds. Pour milk/cream mixture in and freeze for an hour. 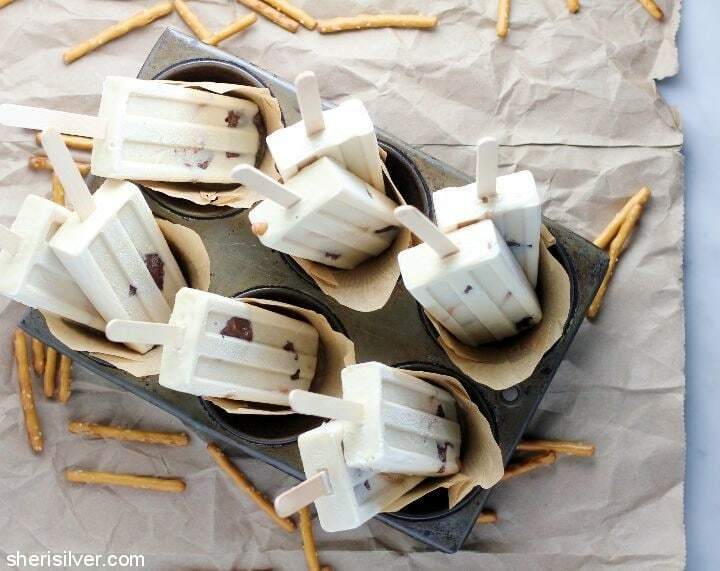 Add popsicle sticks and freeze overnight. For all the pops check out my Pinterest board!